Parents usually recognize when their child has to go to the bathroom (the wiggle, the crossed legs). The trick is turning those signals into teachable moments so your child recognizes that what’s going on can go into the potty! Christine Louise Hohlbaum, an American living in Paunzhausen, Germany, says both of her children, a boy and a girl, potty trained easily and were completely trained by 25 months. She says she really focused on helping them understand their bodies’ signals. Dr. Linda Sonna, a psychologist, public speaker and the author of The Everything Potty Training Book (Adams Media Corporation, 2002), suggests other clues a parent can pick up on to help their children recognize when they have to go, such as smell. Don’t forget that imitation is definitely the sincerest form of flattery when it comes to your children. Telling your children when you feel like you have to pee or have a bowel movement is important modeling to help them understand how adults “decide” when they have to go, says Valre Welch, a pediatric nurse practitioner for Children’s Urology of Virginia. Children need to be mature enough to understand what their bodies are trying to tell them. It’s also important, notes Welch, for children to be monitored for urges often enough to determine that they’re not trying to hold their urine or bowel movements in order to please their parent or caregiver. In other words, praise them for going on the potty but not necessarily for staying dry or clean. “Holding it” can lead to urinary tract infections (especially in girls) and other problems. Catching your child when she has the urge is the best way to help her realize she has control over her bodily functions. One thing Welch knows as an expert and Hohlbaum knows from her expert “mom” experience is that children need to be mature enough to understand what their bodies are trying to tell them. If they aren’t, all the role-modeling and encouragement in the world aren’t going to help with training. From there, gentle encouragement and reinforcement are the keys to stress-free training. Welch suggests using a small potty chair rather than one that attaches to the big toilet. She says children seem to like the stability of having their feet on the floor. Gather support from surrounding family and friends. Read a child-friendly potty training book. Welch agrees with this gentle approach, noting that potty training is not just a question of knowing they have to go. She says other components include language, ability and motivation. For language, decide early on what that’s going to be, whether it’s “pee” or “urine” for urination or “poop” or “BMs” for bowel movements, etc. Use the words you’ve chosen when talking to your children and changing their diapers so they have that language and can communicate with you. For ability, children need to be able to crawl or walk to the potty, be adept enough to take down their own pants and wipe themselves and re-dress themselves. As for motivation, every child is different. Some, says Dr. Sonna, may be so sensitive to a dirty diaper that potty training is almost a relief for them. Others may be motivated by older siblings or peers who are already potty trained. 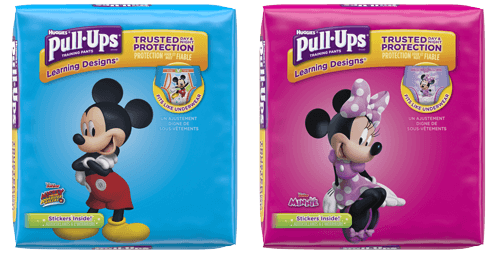 By taking our brief assessment, Pull-Ups® can help determine what type of personality your potty trainee is and provide tips and advice based on the results. The most important thing to remember is that potty training doesn’t just happen overnight — it takes time and patience. Understanding that your child needs time to perfect this whole potty thing will help everyone have a less stressful experience.